I’ve written a lot about work — about office etiquette and stresses and violence; promotions and firings and telecommuting; and about “office politics” and what passes for office humor. See the comic strip “Dilbert” and the hit American TV show “The Office” for more about workplace humor, much of it doleful, akin to sarcastic “jailhouse humor” among those trapped in the hoosegow. And rent the 1956 Gregory Peck movie “The Man in the Gray Flannel Suit,” based on the Sloan Wilson novel, if you’d like a sobering course in corporate conformity that modern office life produced. Right now I’d like you to consider the office itself. Not some “virtual” one but the old-standby bricks and mortar and wallboard, the receptionist area and drinking fountains, the coffee pots and corner views and cubicles in which faceless schlubs with dreaded “desk jobs” are said to toil. Sad to say, a lot of us spend more of our time on earth there than we do anywhere else. 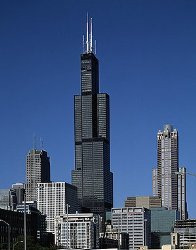 What goes on inside office towers such as San Francisco’s Transamerica “Pyramid” and New York’s Empire State Building, lower buildings in smaller towns, and office parks in suburbia drives the nation’s economy and reflects our competitive culture. How Americans work, what we produce, and even WHY we work have been extensively studied. 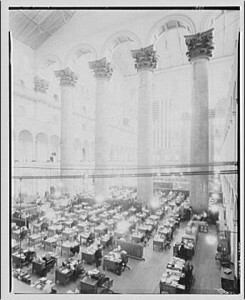 Some time ago, for instance, the National Building Museum in Washington, D.C., mounted a revealing “On the Job” exhibition and published a catalogue of essays commissioned for it, on WHERE we work and how it has changed since the U.S. Civil War of the 1860s. That was about a century before the foundation of the American economy had fully morphed from blue-collar factories to enterprises selling ideas, “services,” and technological doodads. The seed was planted as former officers from the Civil War took charge of emerging white-collar businesses, where they instituted military-style hierarchies — down to pools of lowly, closely supervised clerks and secretaries. 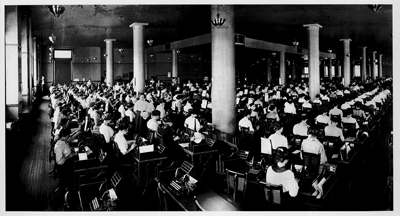 Even 75 years later, in what is now the VOA headquarters building — constructed like a fortress with thick walls and floors designed to support hundreds of Social Security minions, thousands of cabinets, and millions of paper files but instead initially occupied by the U.S. military — file clerks and typists worked in open rooms nearly a city block long. It was quite a step forward when someone thought that even though drudgery went on there, it could be something esthetically pleasing. 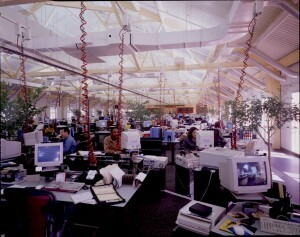 The office of today is the object of a great deal of esthetic consideration. 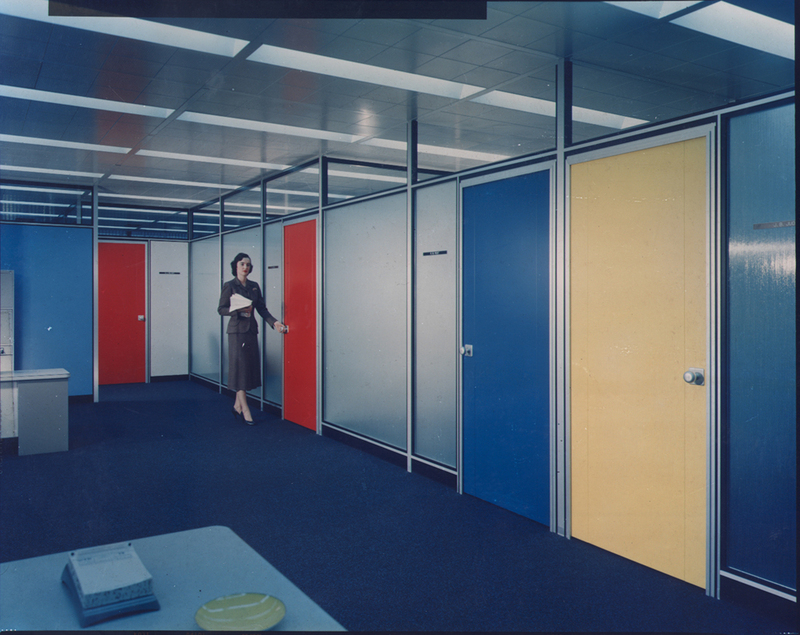 Those cubicles are formed by panels, and a great many people have spent a long time proportioning the panels and deciding what kind of fabric should go on it and what color the fabric should be. Crysanthe Broikos curated the “On the Job” exhibition. 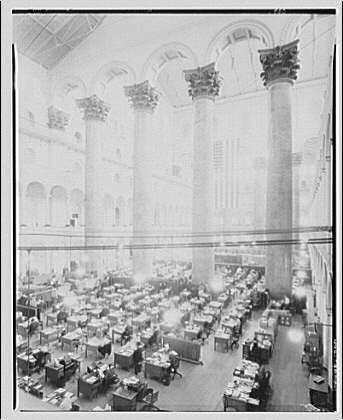 She says that by 1920 most offices were rigidly organized around row after row of what were called “Modern Efficiency Desks,” with metal tops and almost no storage space. I play it the company way. Wherever the company puts me, there I stay. Your face is a company face. It smiles at executives, then goes back in place. Oh, it suits me fine. 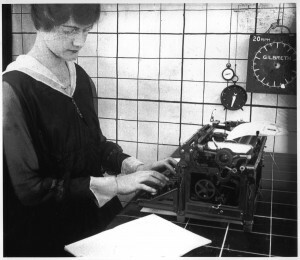 Factory-like regimentation of human workers was fostered by efficiency experts such as Frank and Lillian Gilbreth, whose time-and-motion studies measured everything from keystrokes to the best place to plant one’s feet under a desk. So you play it the company way. All company policy is by me OK.
About five years ago, Fortune magazine, which writes about the people who make, well, a fortune, focused on average “worker bees.” Specifically, on the wretchedly monotonous, confining spaces in which millions of them spend their days. 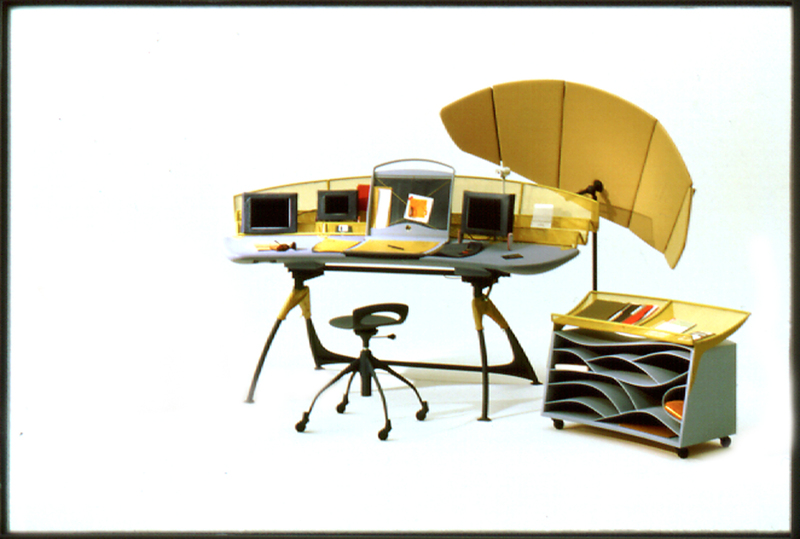 As Fortune lays out the story, Robert Propst, a young industrial designer in the Midwest state of Michigan, dreamed up the office cubicle “workstation” in 1968. It’s composed of “modules” — metal partitions covered in institutional cloth — lookalike desks, eye-level shelves. All of it unscrewable and easily lugged to the next cubicle farm down the hall. The only real differences among the walls, intended to give workers at least a tad of privacy, were their height and color. From above, the pods look like tic-tac-toe games, with human beings, bending to their daily tasks, as the Xs and Os. Cantilevered from die-cast aluminum legs, the rubber-edged desks had plastic-laminate work surfaces that could be covered at night with a roll of canvas or a wood tambour. The accompanying seat was not a chair but a tall, narrow perch; other elements included a movable storage unit and a sound-insulated “communications center” for telephone and Dictaphone use. Imaginative. But functional? Comfortable? Conducive to work and cogitation? Please. Soon, office mazes sprouted from coast to coast. Everybody below the rank of vice president worked in one of these boxes, identical to the next one save for the photos of the missus or mister and the dog. In our newsroom, even high-ranking editors work out in the maze, under the glare of fluorescent lights, in the name of egalitarianism and ready consultation. 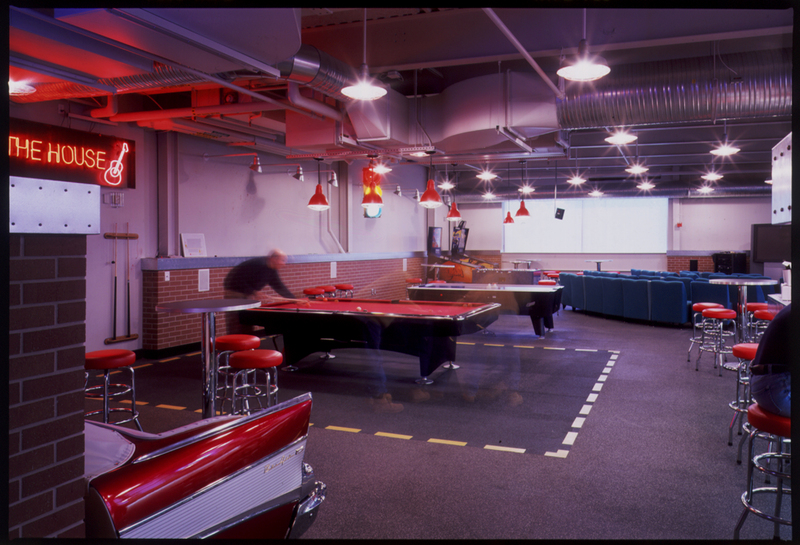 “Most office space has been speculatively built for unknown tenants with unknown needs,” Broikos and Donald Albrecht, a noted curator of design at the Museum of the City of New York, wrote in their introduction to the “On the Job” catalog. Or, as William H. Whyte wrote in his scathing 1956 study The Organization Man, “Organizations seek the adaptable, interchangeable person” to work in interchangeable, adaptable compartments. 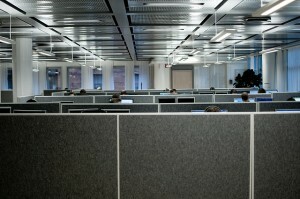 Cubicles are ridiculed — even loathed, and not just by me — as symbols of conformity. Anyone who tells you he loves his cubicle is lying. Who enjoys the life of a clone or a drone in a box? For sure, the illusion of privacy evaporated, as cubicle dwellers cannot help but overhear their colleagues’ phone calls, sensitive in-person conversations, and wheezes, sneezes, and snorts. Snores as well, on occasion. Lots of people, including Scott Adams, the artist who draws “Dilbert,” which satirizes the corporate culture, have tried to humanize the sterile cubicle. The “ultimate cubicle,” as he calls it, allows occupants to vary the flooring and lighting. They can even add a fish tank. But a cube is still a cube. 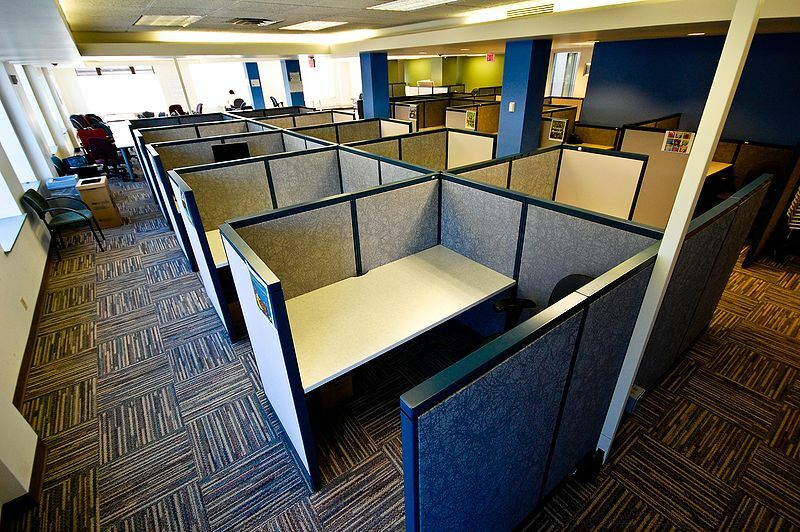 James Russell, editor-at-large of Architectural Record magazine, told me that in truth, increasing output or employee togetherness and facilitated consultations among employees had little to do with unleashing the cubicle craze. And designing them isn’t as simple as it looks. The National Building Museum’s “On the Job” catalog includes a diagram of intersecting lines and circles under the heading “Who Creates Offices.” Not just some architect or interior designer hired by the company’s grand poobah, it turns out. Civil engineers, furniture suppliers, legal consultants, “voice and data” firms, building security, and building-code bureaucrats all have a hand in it. 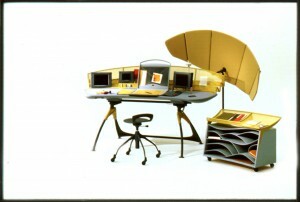 The diagram left out the ergonomic gurus and lighting specialists. Creative firms loaded with smart, casually dressed young people in California’s Silicon Valley, North Carolina’s Research Triangle, and New York’s Madison Avenue at first embraced the open-office, cubicle model. 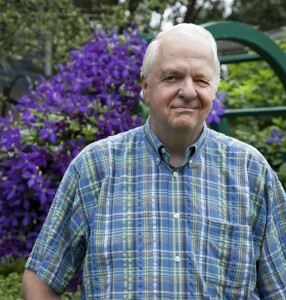 They felt it fostered collaboration and innovation. Soon flooded with complaints about stress, annoying office mates, and the lack of focus in “bullpen” environments, however, companies tried to compensate by providing perks to make up for the paucity of privacy. A wave of coffee bars and exercise areas — even “chill-out-rooms” with pool tables — swept the country. One advertising agency even tried holding idea sessions in a Tilt-a-Whirl car taken from a carnival ride. This wasn’t as New Age-y as it sounds. Progressive outfits such as the Larkin Company of Buffalo, New York, offered their employees, who labored cheek-by-jowl in noisy, open atriums, amenities such as lunchrooms and clinics — even bathhouses — as early as 1900. The culture of early offices was one, for example, in which there was basically no opportunity for women to get ahead. Yes, people might like the terrazzo floors and the marble and the granite and so forth. But I don’t think that most people would want to go back to the values that those buildings represent. Think about the lesson in that: You have to slink off to the stairwells, away from the deadening cubicle array, to think and create. I’m just sayin’ . . .! Whatever happened to the Walt Disney-depicted world in which you could . . .
Just whistle while you work [you can supply the puckering]. When hearts are high, the time will fly, so whistle while you work. 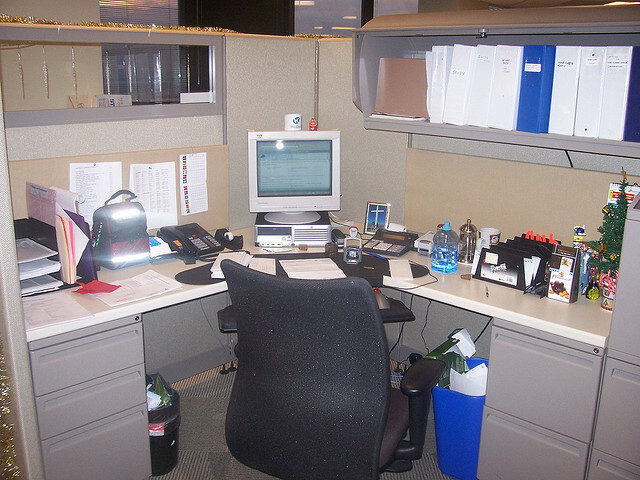 The office was one of the first places where new technology — think computers, cellular phones and pagers, central air conditioning, even electric staplers — were tested and, often begrudgingly, accepted before they filtered into the home and other aspects of daily life. Do you think life in a cubicle farm — picture henhouses — might have something to do with the eagerness of employees to work at home in their jam-jams a day or two a week? It’s not all because of grueling commutes. But don’t jump to the wrong conclusions, the National Building Museum’s Chrysanthe Broikos cautioned me. The office is not going away. You know, the “paperless office,” that’s not coming, either. [She laughed here.] I think because work is so specialized nowadays, we do need specialized places to do different kinds of work. So the office itself may change, but the need for the office isn’t going to. The forces of conformity and freedom, centralization and mobility, the status quo and radical change are colliding in the American office. Ever since pool typists slipped the first standardized sheets of paper into row after row of cumbersome typewriters — can’t you just hear them clacking? — the office has reflected the evolving American culture. So do many of the people who work in such buildings and corridors. They are the “interchangeable persons” for whom the modern workplace is designed. Devolve. To pass to someone at a lower level, as in delegating authority to subordinates. Ergonomic. Designed to minimize discomfort and fatigue, and maximize efficiency, especially in the workplace. Hoosegow. A slang term, often heard in B-grade detective movies, for a jail or prison. The word evolved from the Spanish "juzgado de guardia," or police court — usually a night court that was one quick step from a minimum of a night in jail. Perks. Shortened from the less-familiar word “perquisites,” these are benefits, special favors, and luxuries that go with certain political or business positions. Company cars and first-class air travel, for instance, are sought-after executive perks. Schlub. From Yiddish, a less-than-ordinary, talentless, plodding person. Hello. If we really work, it means our hands and feets are working and moving. In this I.T. age, can we not make full use of the tablet or laptop or even iphone ? Meaning when there is a piece of work, we carry our computer gadget around and we get on to do what we are supposed to do. Then we go home. At home we continue working, doing works that require sitting down. There is no need for offices. It is flexi hours. And the company can cut down on equipments, electricity and what have you and all these add to the profits. Why do we spend our working time in the tea room scheming ? Scheming belongs to the high management. There will come a day soon when workers stay home. All they need is a computer which will do everything. Automated jobs. Video conferencing for meetings in the comfort of your own home. There is no need for promotion. If the team does their work well, there will be salary increament, bonuses and financial reward.